Even the most casual observer of German football is aware of how bad Borussia Dortmund's start to the season has been. The only club to seriously challenge Bayern Munich for domestic supremacy over the past five years are currently sitting in 16th place in the 18 team Bundesliga and rather than challenging for honours, Jurgen Klopp's side are staring at the very real possibility of a relegation dog fight. Despite their recent struggles, which continued with a 1-0 loss to Hertha Berlin this past weekend, Dortmund still displayed the class that has won them the admiration of a lot of neutrals. 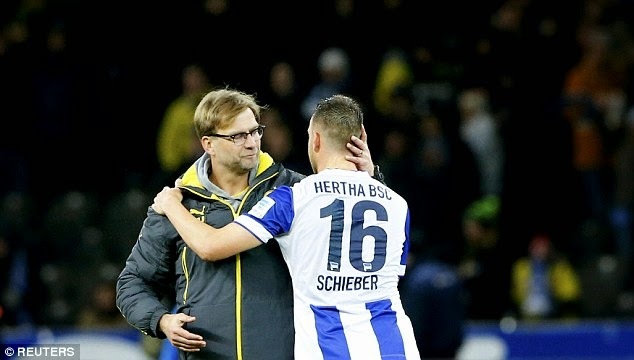 After a Hertha player, Per Ciljan Skjelbred, lost his boot following a challenge, and was effectively out of the play, Dortmund's players refused to seize on what would have been an easy advantage and just played the ball around until Skjelbred was able to return to the action. It was a wonderful piece of sportsmanship that you don't often see at professional level. Considering Dortmund were in desperate need of three points they showed a nice bit of class in this situation, which should be applauded. I'm in North America and am able to see it, they must have stricter copyright restrictions on Bundesliga highlights in Germany. If I find an alternate link that might work for you, I'll post it up.